During the hustle of the holidays, we often neglect the very hands by which we work. Revitalize chapped winter fingertips with this easy Rose Geranium and Bergamot Cuticle Balm. Vitamin E, rice bran, and jojoba nourish and hydrate while lanolin and beeswax protect the nail bed from further damage. Also works great on the driest areas of the body, such as the elbows and bottom of the feet. This recipe may easily be doubled or tripled and dispensed into multiple tins as thoughtful holiday favours. In a double boiler, add beeswax, rice bran oil, jojoba, and lanolin. Allow to melt completely, taking care not to overheat and stir occasionally. Remove from heat and add vitamin E and essential oils. Swirl gently with a toothpick or clean spoon to fully incorporate, then pour into 2oz tin. Allow to cool completely before securing lid and labeling. For easy cleanup, wipe out double boiler with paper towel while material is still warm. Wash with hot, soapy water. 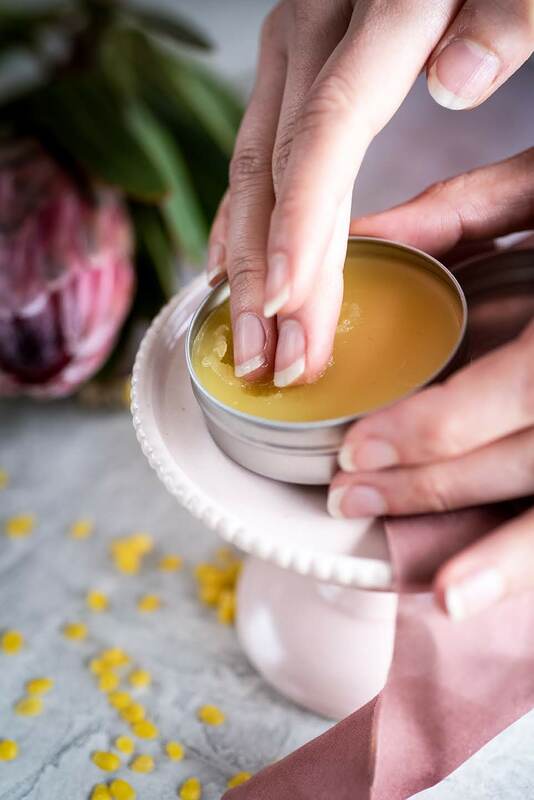 Apply small amount of Bergamot and Rose Geranium Cuticle Balm to dry cuticles by gently massaging into nails, cuticles and surrounding skin. It works well over polished nails as well.